What do we really know about trust? It may be the subject of numerous books and conference papers, bandied about on social media, yet it’s clear that few of us understand why it’s an essential rather than desirable to good customer management. Two years ago, I embarked upon a Doctorate (DBA) at Southampton University. I wanted to know what exactly trust is, whether organisations can develop it, and if so, how, and what quantifiable gains it brings them. Over the last couple of years, I’ve been sharing my insights through blogs and articles. My promise in a very early blog was…….. I am now into my third year of the doctorate, researching B2B trust in a relational context. During this time, I have reviewed hundreds of academic works on B2B trust for insight development. That’s a lot of reading!!! This reading has exposed a gap in current research knowledge on ways trust is applied in B2B. My aim is to address this gap. So……..what have I found out? Mayer, Davis & Schoorman (1995, p712) The willingness of a party to be vulnerable to the actions of another party based on the expectation that the other will perform a particular action important to the trustor, irrespective of the ability to monitor or control the other party. Rousseau et al (1998) Trust is the willingness to be vulnerable based upon positive expectations about another’s intentions or behaviours. This definition has been developed into a practical and applicable form. You can apply it to your relationships to measure how they match up against the definition and where you could focus to address any gaps. The research to date broadly supports the initial premise of trust operating on a horizontal axis – how trust develops over time within a relationship. It has surfaced a couple of interesting areas: one I am calling the ‘Goldilocks Zone’ and the other one the ‘Dark Zone’ – more about these in future blogs. Furthermore, the research has surfaced triggers, both hard and soft, that enable an organisation to gain a ‘Goldilocks Zone’ position and hold on to it. It has also identified how to avoid the ‘Dark Zone’. Currell & Inkpen (2002) discuss trust operating within a relationship at an inter-organisational, inter-team and inter-personal level, against a vertical axis. It is evident from the research that trust is a different construct at inter-organisational level than at the inter-personal. At organisational level it is operating as an action / behaviour conceptualisation. An organisation has the potential to develop trust through its past, current and future intentions, the reality of those intentions and the effect that had and could have. To be honest there’s a load more, however will save it for another blog. 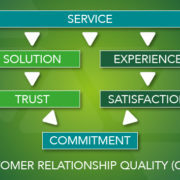 The definition of trust within B2B provides a framework to sense check and develop a customer relationship. The insights into how trust operates on a horizontal and vertical axis provide a platform for the pro-active development and maintaining trust.